Red-winged Blackbird Migration has begun around these parts in Kentucky. It has just been in the last week or two that I started to notice more of them coming around and making themselves heard throughout the day. I never mind them as they are such a beautiful blackbird. We always have a few that hang around all winter here and that is pretty normal throughout the United States as they are a year round songbird. They migrate either short distances or longer distances depending on where you live. Of course in winter time they are not as plentiful but come late February or early March they start to show up by the numbers. And…boy do you know they are around too with that high pitched calling that is definitely the signature of a Red-winged Blackbird. A very welcome one too I might add. Well if you don’t already know about this pretty bird, the males are black with a bright red shoulder that has a yellow border (they call it epaulets). When in flight you can’t miss that brilliant red as it is flying towards you especially in the bright sunshine. Very beautiful indeed! Females like most other bird species do not have the beautiful coloration like the males. That is because they need to be less noticeable or camouflaged while on the nest to deter predators. 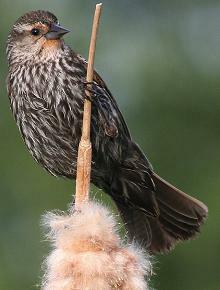 Red-winged Blackbird females are dark brown in color with a streaked breast. When I first see one at my feeder I usually mistake it for either a sparrow or a female Rose-breasted Grosbeak (wishful thinking on my part). However, all I have to do is check the beak because the Grosbeak has a thicker one. I happen to have a lot of Red-winged Blackbirds around my property because I have a small lake/pond close to my house. 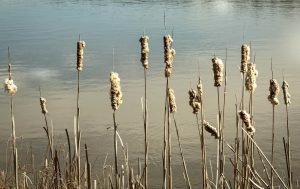 There are cattails on a small part of it that they like to nest in. They prefer to be close to water and can also be found in other marshy type areas or wetlands. They feed mostly on insects such as beetles, grasshoppers, and caterpillars as well as seeds. However, they will also eat spiders and snails. The males are polygamous often taking more than one mate (up to ten or fifteen females sometimes) during a breeding season. Breeding starts in early spring and can go up to mid summer. The female builds the nest and also incubates the nest which takes up to eleven days. She may lay up to four eggs that are pale bluish green that has ink looking splotches of black or purple on them. Both the male and female feed the nestlings with the female doing more. Go figure if he has so many other nestlings to attend to ;-). Both male and female can be very aggressive toward other birds coming near the nest. They are not afraid to attack larger birds who might intrude. The young will leave the nest after about two weeks of hatching. The males will flash their red shoulders, while hunching forward and spreading their tails to either attract a female or defend its territory. 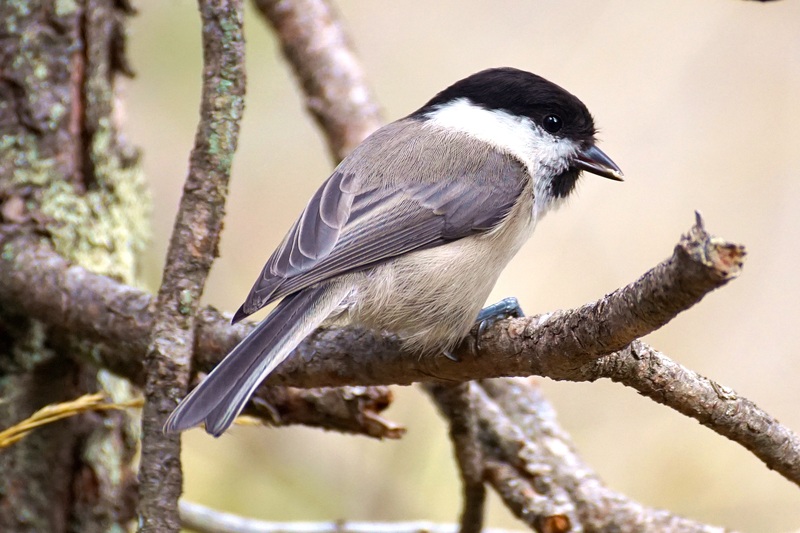 It is a medium sized songbird that is one of the most abundant species. Juveniles reach maturity in two to three years. The red coloring on the male is more prominent as it reaches maturity at around two years. These blackbirds eat insects mostly during breeding season. After that they eat more grains and seed. A Red-winged Blackbird’s predators are fox, snakes, weasels, and hawks which mostly prey on the nestlings. They tend to form in large flocks mixed in with other blackbirds. Most people enjoy seeing Red-winged Blackbirds in their yard. The males with their flashy red shoulder marks are unmistakable when you see them flying in the sunlight. Females not so much as they are dark brown in color to mask themselves from predators during breeding time. AND….their loud vocalization is not too hard to miss as you can hear them throughout the day calling. At least they do around my house. In the United States they are year round birds but they do travel short distances southward during migration time. You may not have as many during the winter months but come late February or early March look out for them as they will become more abundant and vocal. You can’t miss them. Most people call it a sign of spring as I do and that is a good thing! 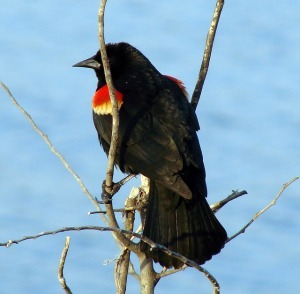 Are Red-winged Blackbirds a welcome sight in your neck of the woods? Please feel free to share and make your comments below. It is always greatly appreciated! Posted in Backyard Birds, Songbirds and tagged red-winged blackbirds, spring migration. ← Why Do Woodpeckers Peck Houses? Wow, I really enjoy reading the whole article. It’s too descriptive about Red-winged Blackbird. That amazed me to see that they can even attack larger bird if necessary!!! Are they found in Asian Countries as well? Himz, thanks for your comment! Red-winged Blackbirds are not found in Asian countries but you have your own fair share of neat birds there. Attracting birds to your garden just takes a little research to find out what they eat, how they breed, and type of habitat. It is fun to attract different ones and very entertaining too! We live in Minnesota and we do enjoy our birds and have feeders located in our backyard. We look forward to our red winged friends each year. We have a pond with ample nesting places, which is why we get a large flock of them. But we noticed that they just vanished and not even going to our feeders and that even most of the other birds are no longer visiting our feeders either. Any opinions or theories about why the red-winged seem to just vanish? We live in Minnesota and we do enjoy our birds and have feeders located in our backyard. We look forward to our red-winged friends each year. We have a pond with ample nesting places, which is why we get a large flock of them. But we noticed that they just vanished and not even going to our feeders and that even most of the other birds are no longer visiting our feeders either. Any opinions or theories about why the red-winged seem to just vanish? Yeah, our Red-winged Blackbirds disappeared a few weeks ago. All of a sudden they were gone. That is because they are gathering in large flocks now. They generally do this starting in late summer with other blackbirds such as grackles and starlings. They are feeding in large open farm fields for grain and corn. You probably won’t see them around your place until spring when they start their breeding season again. Thanks for your comments.